On July 27, 1953 after three years of a frustrating war, the United States, the People’s Republic of China, North Korea, and South Korea agree to an armistice, bringing the Korean War to an end. Korean peninsula is still divided today. Three weeks ago North Korea has decided to close its only direct diplomatic link with Washington. 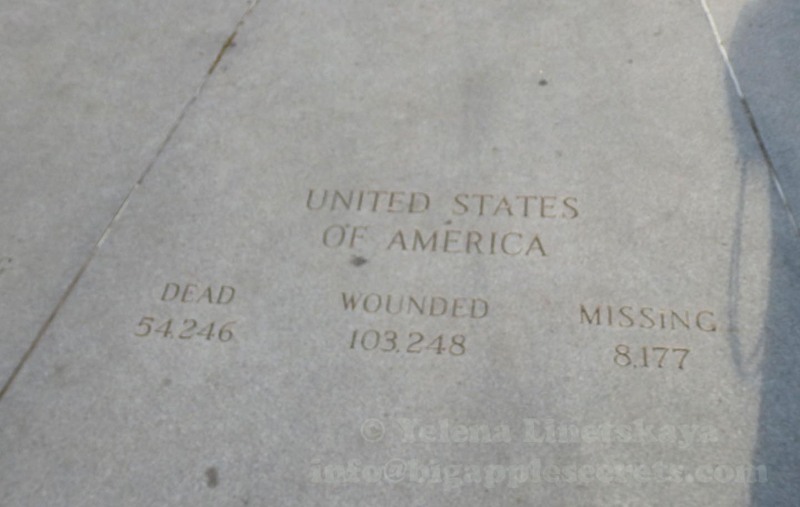 In all, some 5 million soldiers and civilians lost their lives during the war. 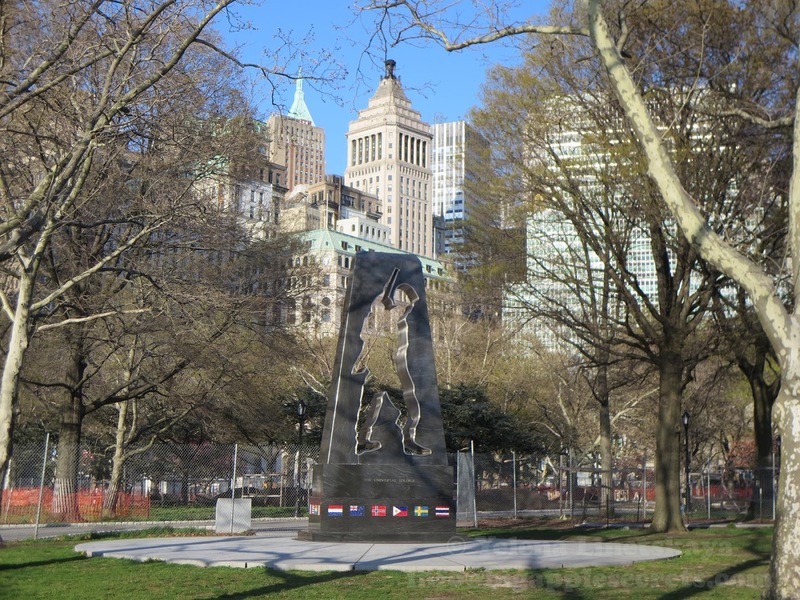 There is a monument of a soldier’s silhouette carved from stainless steel on a base of black granite in the Battery Park just a stone's throw away from the Sphere - a large metallic sculpture that once stood in the middle of the plaza between the World Trade Center towers. 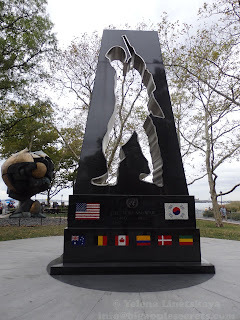 Erected in 1991, this sculpture was meant as a Korean War Veterans Memorial, although it's labeled "The Universal Soldier" . 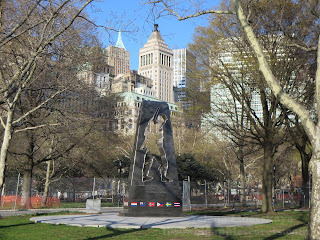 By the way the memorial has nothing to do with the 1992 Jean-Claude Van Damme movie of the same name. Every July 27 at 10 AM, the anniversary of the end of the Korean war, the sun shines through the head of the cut out soldier and lights up a plaque at the base of the statue. 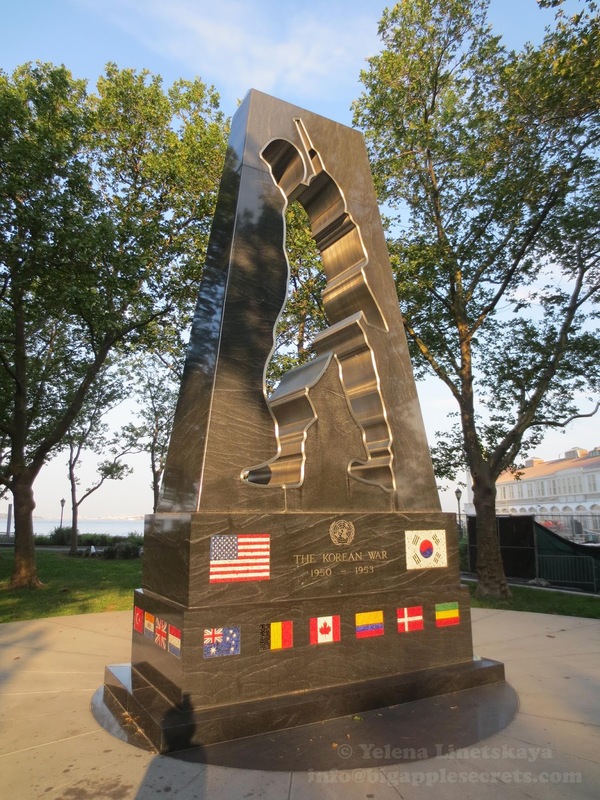 Three tiers support the sculpture, each engraved with the flags of the 22 participating countries. 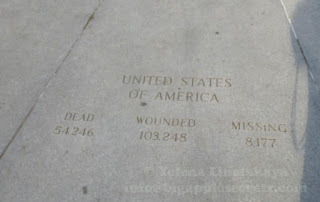 The plaza’s paving blocks are inscribed with the number of dead, wounded, and missing in action from each of the 22 countries that participated in the war. At the end of World War II, Korea was divided at the 38th parallel into Soviet (North Korean) and U.S. (South Korean) zones of occupation. Two new ideologically opposite countries were established in 1948: The Republic of Korea (South Korea) and the Democratic People's Republic of Korea (North Korea). In these circumstances I have ordered United States Air and Sea forces to give the Korean government troops cover and support. The attack upon Korea makes it plain beyond all doubt that Communism has passed beyond the use of subversion to conquer independent nations and will now use armed invasion and war". The American war in Korea lasted three years. Over six million soldiers, sailors and airmen fought on both sides in the Korean War. More than three million of these were from North Korea, China and Russia. Opposing them were almost three million from South Korea and from United Nations countries including Australia. 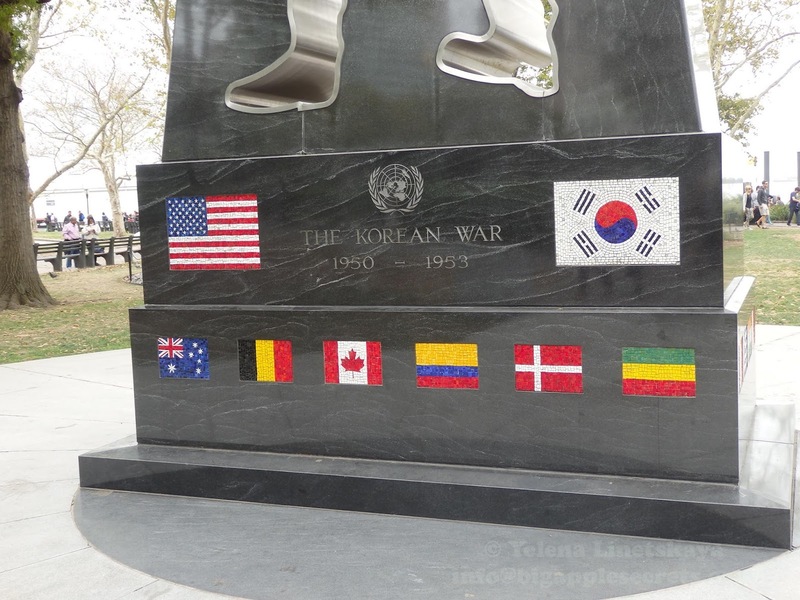 Fifteen foreign nations other than the United States and South Korea sent combat forces to serve in the United Nations Command in Korea during the Korean War. Eight foreign nations deployed more than 100 naval vessels to Korean waters . Five noncombatant nations provided hospitals or ambulance units. In 1987 the Korean War Veterans Memorial Committee was formed to raise money to build a monument to commemorate the soldiers of the “forgotten war.” The winning design was done by a British sculptor Mac Adams. 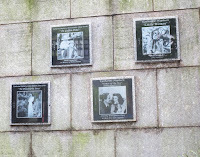 The memorial was installed in 1991. It was the first major Memorial dedicated to the Korean War in the United States. 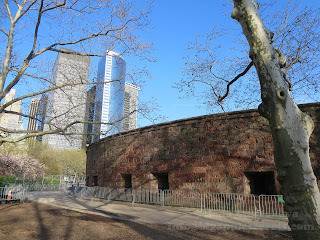 At the southern tip of Manhattan Island, Battery Park was named for the artillery batteries constructed there in 1683 to protect the settlement of New Amsterdam, later New York. 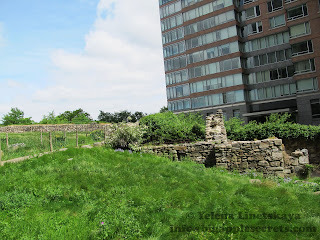 Castle Garden is the major landmark within the 25 acre waterfront Battery park. It was constructed between 1808 and 1811 , later city turned the area into an entertainment center with a restaurant and a theater. From 1855 to 1890, the Castle was America's first official immigration center. From 1855 through 1890, Castle Garden processed over 8 million immigrants. 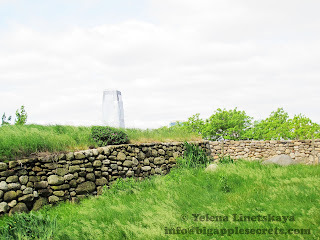 Yiddish-speaking Eastern European Jews pronounced it as Kesselgarden. Among these people was Louis Rudinsky, Belarusian immigrant. Later Rudinsky cut his last name to Rudin and started with a dry goods store on the Lower East Side. The first four of his children were born in a small apartment at the rear of the store where the family lived. The Rudinsky grocery sold a lot of kerosene. John D. Rockefeller of Standard Oil once stopped at Rudinsky house and Rockefeller surprised Lewis by walking in and introducing himself. "Mister Rockefeller I'm honored to meet you",- Rudinsky said. According to Jack Rudin, the great- son of the patriarch of the family his grand dad had enough courage to engage Rockefeller in polite conversation and asked him where he lived. "I live on Fifty-Fourth", was the answer. 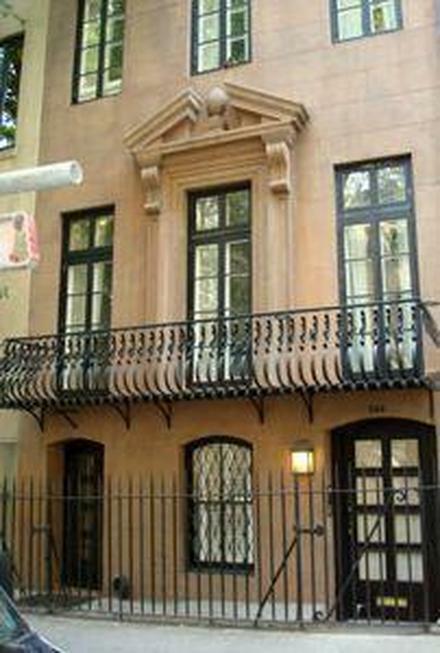 So when in 1905 the real estate broker advised Rudin to buy piece of real estate, a small apartment house on 54th, Luis said:" If it is good enough for Mister Rickfeller it's good enough for me" and bought the house even without looking. It was building 153 on East 54th Street. To this day the building remains a cornerstone of Rudin portfolio. Samuel Rudin , son of Louis Rudinsky and his brothers founded Rudin Management Company in 1924 to oversee the family's growing portfolio. Now the family owns about 14 million sq. ft. in the most prestigious parts of Manhattan. In 1975 Samuel Rudin commissioned Spanish sculpture Luis Sanguino to commemorate not only his father but many immigrants that passed through Castle Clinton. Barcelona-born sculptor, Luis Antonio Sanguino Pascual has created hundreds of important sculptures and monuments in Spain, Mexico, and the United States. In the late 1950s, Sanguino became the youngest member ever elected to the National Sculpture Society of New York. 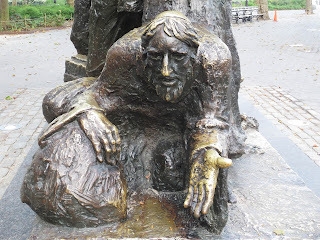 Sculptor included in his work Eastern European Jew, a freed African slave, a priest, a worker and his family. 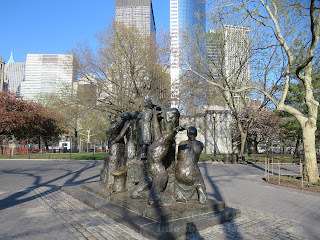 The inscription on the base of the sculpture reads: "DEDICATED TO THE PEOPLE OF ALL NATIONS WHO ENTERED AMERICA THROUGH CASTLE GARDEN IN MEMORY OF SAMUEL RUDIN 1896-1975 WHOSE PARENTS ARRIVED IN AMERICA IN 1883". Although Rudin died in 1975, Rudin’s family took up the campaign to install the sculpture at the park, and it eventually was dedicated on May 4, 1983. 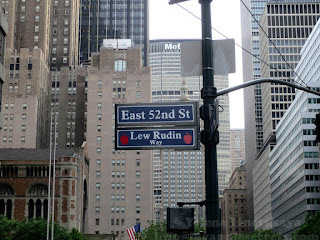 Lewis Rudin, the son of Samuel Rudin, played a leading role in rescuing New York from several fiscal crises. Rudin helped found the Association for a Better New York- ABNY, along with a group of prominent New Yorkers. The association devoted itself to turning the city around, embarking on ventures that included “adopting” a Bronx school, spearheading the famous “I Love New York” ad campaign and helping to pay for bulletproof vests for the New York Police Department. 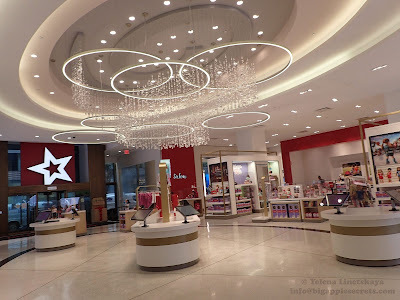 Rudin became known as “Mr. New York.”He was a tireless advocate for New York City and its people until his death in 2001. 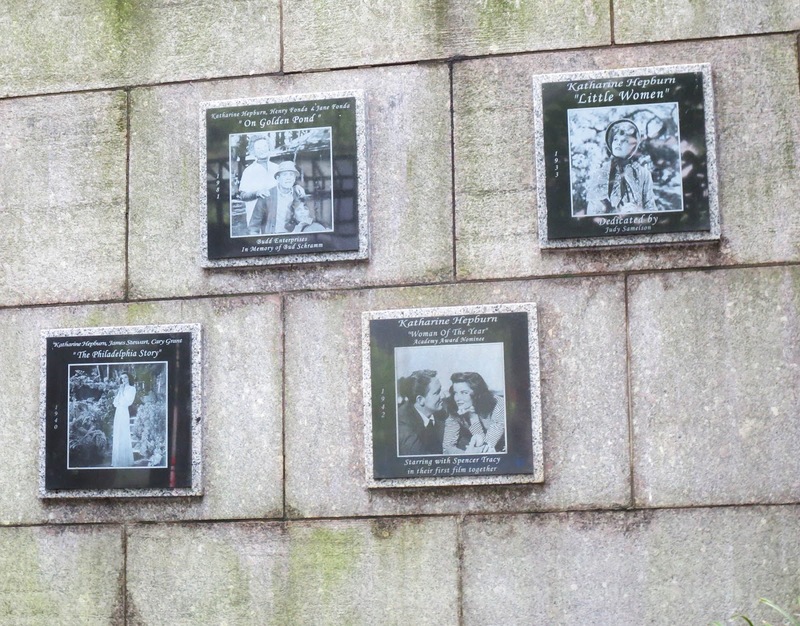 For his efforts on behalf of the city, Rudin won many awards, including the Bronze Medallion, New York City’s highest civic award, and the Living Landmark Award, which is given by the Landmarks Conservancy to distinguished New Yorkers. 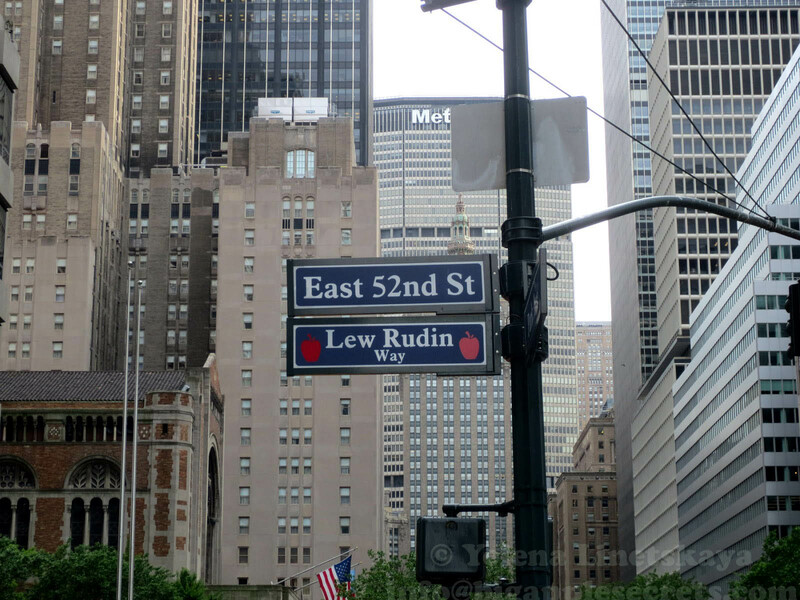 The block of East 52nd Street between Park and Lexington avenues is named “Lew Rudin Way,” and the street sign hangs above the corner where Rudin used to buy hot dogs at an outdoor stand. New York City’s legendary big parks get all the attention, but they also get all the crowds. 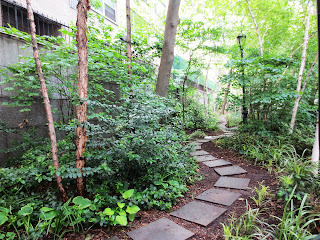 Small parks are less known and sometimes are almost unfilled. 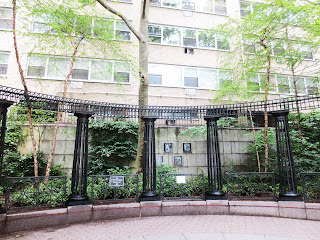 One of such tiny parks is located just around the corner from the United Nations on East 47th street , Turtle Bay. Hepburn hit the silver screen in 1932 and her career lasted for over fifty years . On American Film Institute's list of "Top 100 U.S. Love Stories," compiled in June 2002, Hepburn led all actresses with six of her films on the list. 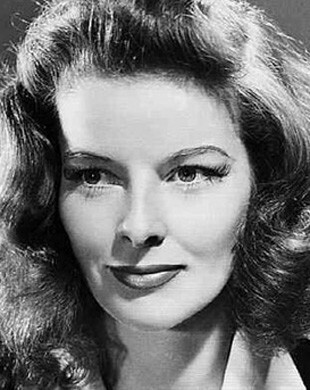 Katharine Hepburn is one of the most famous actresses of the twentieth century. In a career she landed four Oscars – a record even today. 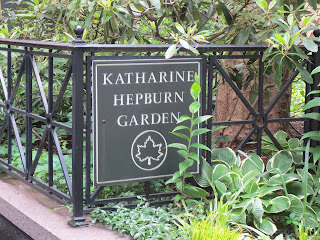 Hepburn lived in a brownstone at 244 East 49th Street at Turtle Bay for some 60 years, from 1931 until the 1990s before she moved to Connecticut. 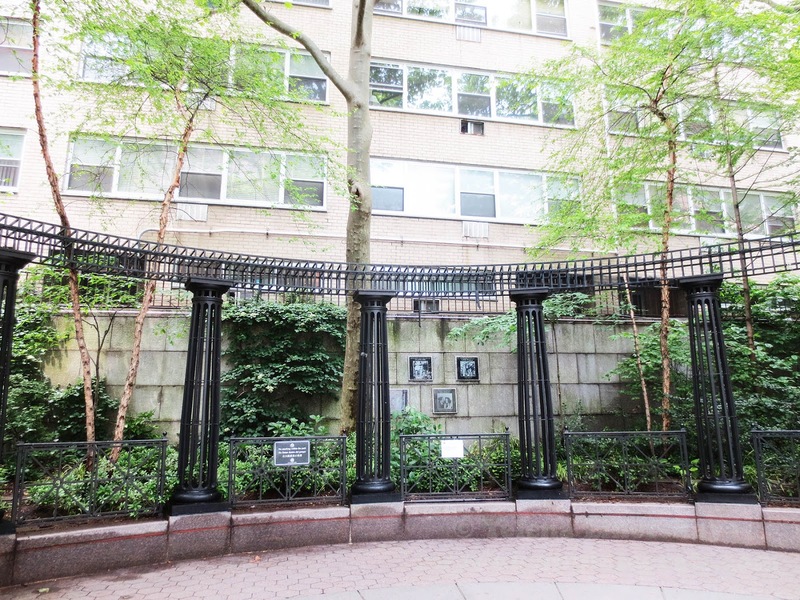 In 1997 Turtle Bay community members dedicated the Katharine Hepburn Garden in Dag Hammarskjöld Plaza. Hepburn 's famously quoted saying “To grow a garden is to believe in tomorrow”. Bill Curtis, president of the Turtle Bay Association, said: "She was involved with the Turtle Bay Association right from the beginning, when it was formed in 1957." 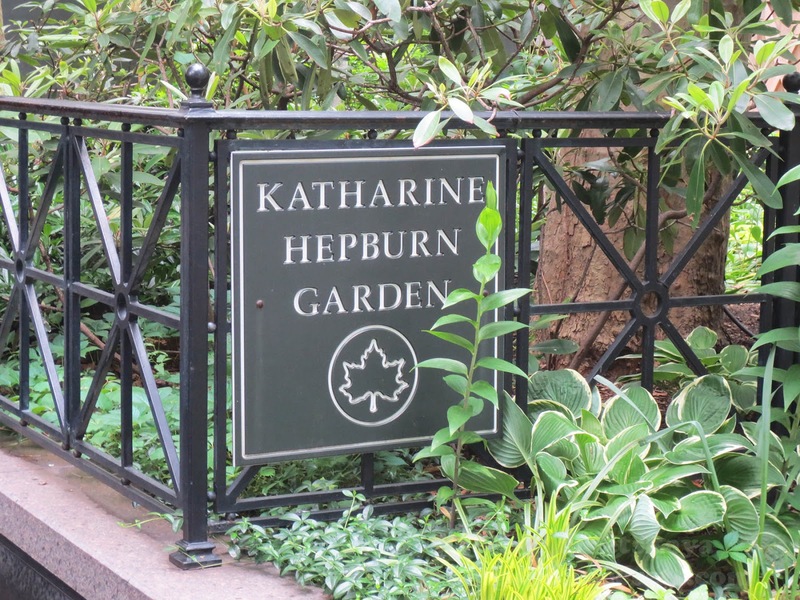 There is a wooden bench in the garden, Kate's Bench, an actual wooden bench from Hepburn's Connecticut home, where she is said to have sat and read the New York Times every morning. 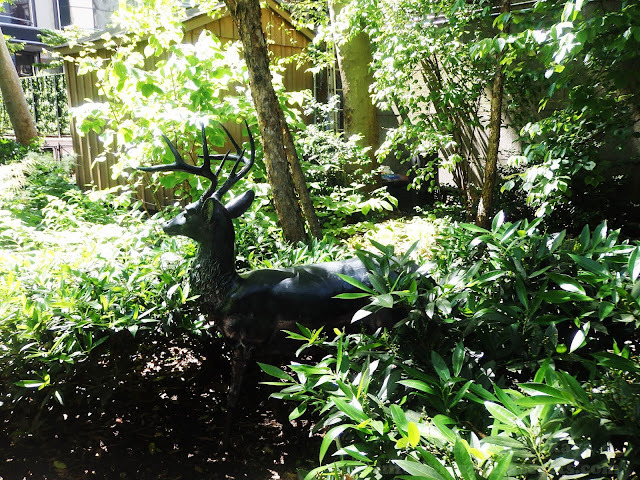 There is also a black metal deer in the garden, hidden behind the green leaves. 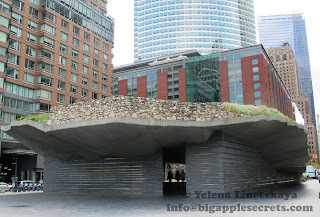 Most people aren't aware there's a small pocket park that runs along wall of the building . You have to open the gate and it's just a walkway through a nice green space. Battery Park on the lower tip of Manhattan is one of the city's green highlights. A 32 acre fringe of greenery is filled with skaters, strollers, and installations of public art. Wedged between financial powerhouses and well-manicured parks, the Irish Hunger Memorial sits in the Northern end of the Battery Park City. 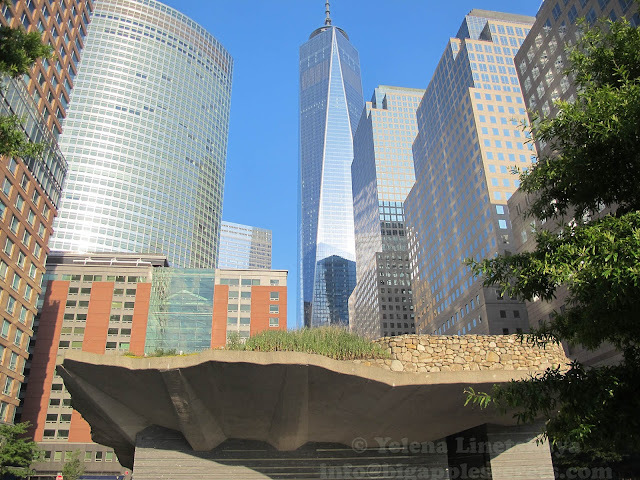 It is a beautiful example of outdoor art in New York. It is a monument to those who perished during An Gorta Mór (The Great Hunger), and is a symbol to highlight areas of the world affected by hunger today. Poorly clad and terribly housed, the Irish peasants in 19 century were entirely dependent on the potato --out of 8 million, some 3.5 million ate little else, consuming 12-14 pounds per day. This dependency was fatal. A strain of Phytophthora caused the widespread devastation of potato crops in Ireland and northern Europe beginning in 1845. The pathogen led to the death of nearly 1 million people and the mass emigration of another 2 million from Ireland by 1855. One of the single-most influential events in U.S. immigration history, Ireland’s great potato famine induced a massive wave of Irish emigration. 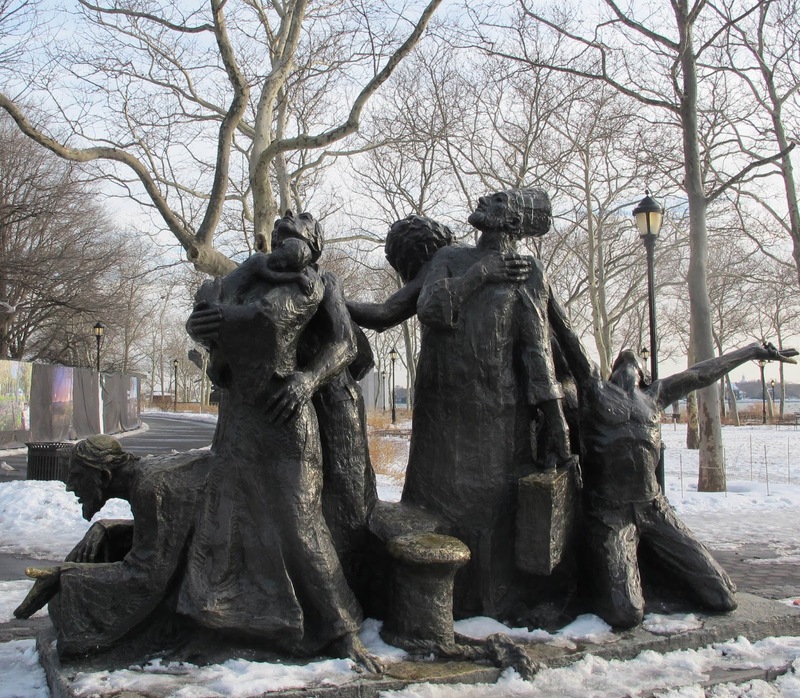 Famine immigrants were the first big wave of poor refugees ever to arrive in the U.S. and Americans were simply overwhelmed. The first Irish to arrive were rejected and perceived as an alien culture that could not be assimilated. By the end of 1850, the population of Ireland had shrunk from 8 million to approximately 5 million, and the majority headed for the U.S., arriving at Ellis Island by the hundreds of thousands. Throughout the Famine years, of the Irish about 650,000 Irish arrived in New York harbor and 75 percent of them landed in New York. 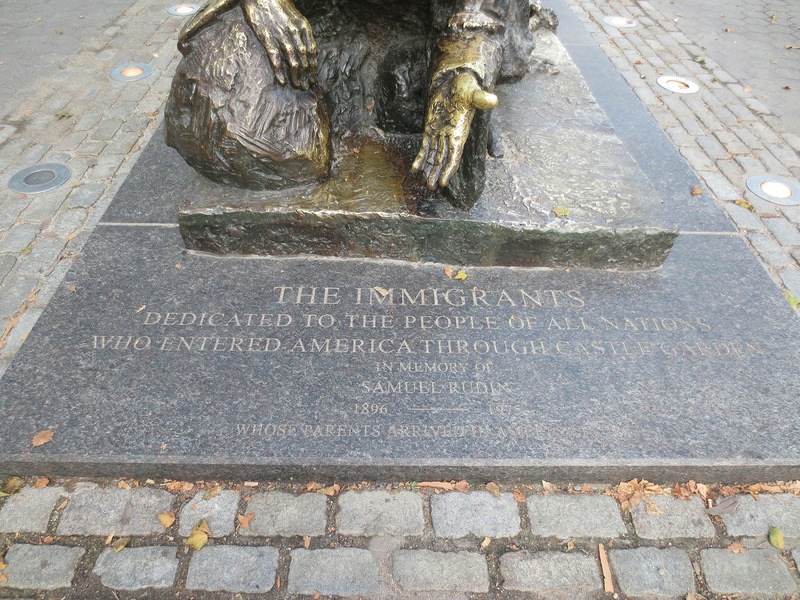 In 1847, about 52,000 Irish arrived in the city which had a total population of 372,000. 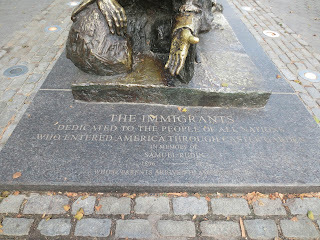 U.S. immigration records indicate that by 1850, the Irish made up 43 percent of the foreign-born population. Between 1820 and 1975, 4.7 million Irish settled in America. In 2002, more than 34 million Americans considered themselves to be of Irish ancestry, making Irish Americans the country's second-largest ethnic group. The most extraordinary Famine descendant was John Fitzgerald Kennedy, great-grandson of Patrick Kennedy, a farmer from County Wexford who had left Ireland in 1849. 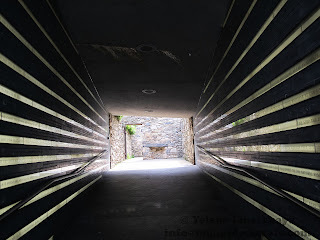 Memorial was created in 2002 by artist Brian Tolle to raise awareness of the Great Irish Famine and of the challenge to end hunger in our world. Tolle says, "It's a living alert, a center for hunger around the world." Memorial site sits on a half-acre piece of land, significant as a clause added to the Irish Poor Law by Sir William Gregory during the famine meant that anyone who owned more than a half-acre of land was not eligible for any aid or relief. Many of the starving were poor but owned a half-acre, forcing them to abandon their homes in order to obtain food. 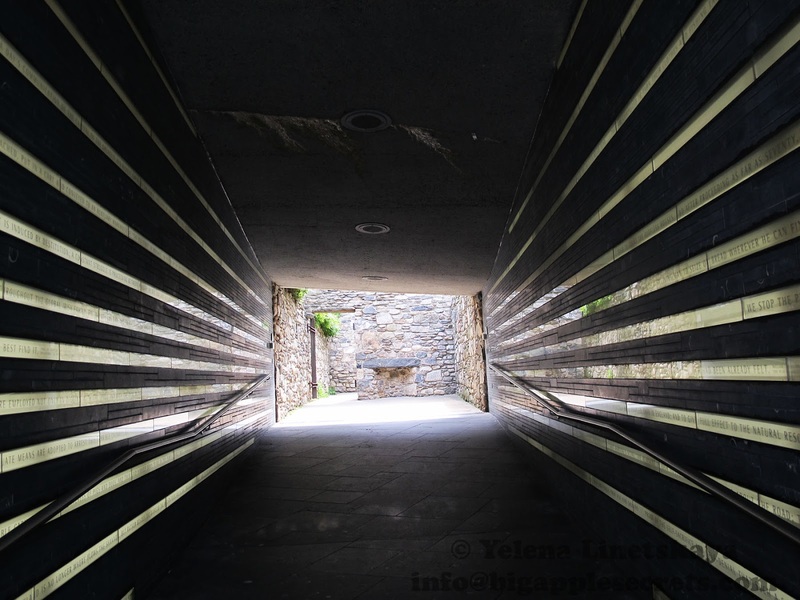 The exterior and interior walls of the memorial are covered by almost two miles of illuminated text of famine poems, statistics and quotes. The texts include old Irish proverbs, such as "Hunger will break through a stone wall" and "The well-fed does not understand the lean." Others are quotes from U.S. presidents: "Hunger does not breed reform, it breeds madness and all the angry distempers that make an ordered life impossible"--Woodrow Wilson, 1918; and "Every day 25 percent of our food supply is wasted"--Bill Clinton, 1998. 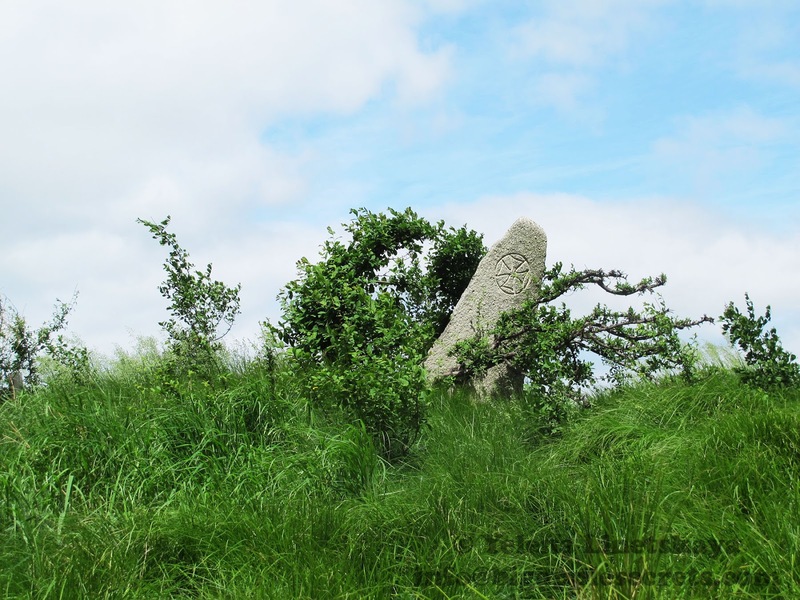 The memorial contains over 60 varieties of Irish Flora such as heather, bearberry, foxglove and gorse, that give the visitor a taste of the harsh but beautiful landscape found in the western portion of the country. 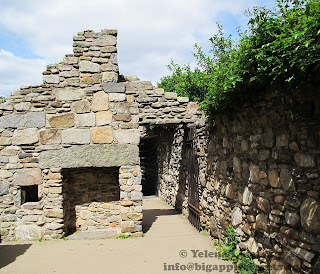 The site also contains stones from all of the 32 counties of Ireland.